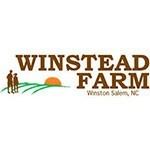 At Winstead Farm we believe that humanely and naturally raised food is the tastiest and healthiest food. We currently offer whole pasture raised broiler chickens. We have raised both Cornish Cross and Freedom Rangers, and plan to raise some heritage breeds as well. The chickens reside in a movable house, and they are moved frequently to fresh pasture where they forage for whatever bugs and plants appeal to them. As they move around the pasture, they also are helping us to rebuild unkempt pasture by fertilizing for us. We are making an effort to process chickens as frequently as possible in order to have a consistent supply of fresh meat.